Professional Cut is a hair oil enriched in Moroccan argan oil. The product was created specially for the professionals (hair stylists, hairdressers) and has smoothing and nourishing properties. It is suitable for all hair types, also the unruly hair. This is the only oil dedicated for hair cut available on the market. How does Sharp Cut oil work? Matrix Oil Wonders Sharp Cut was created for easier hair cut and stylisation. Its composition matches the designation. This hair oil is based on water with one volatile silicon (Cyclopentasiloxane), that protects hair then pretty quickly evaporates. A bit further is a dry emollient (Isohexadecane) preventing water loss, solvent (Hexylene Glycol) and detergent (Poloxamer 184). Right behind fragrance the brand has sadly placed harmful alcohol (Benzyl Alcohol), that can cause dryness, frizz or matte hair, but also there is a preservative (Polyaminopropyl Biguanide). Only after this set is placed information that Sharp Cut Oil in Matrix Oil Wonders Line consists of argan oil (Argania Spinosa Kernel Oil). This Moroccan oil is one of more valuable sources of essential fatty acids, minerals and vitamins. Unfortunately, this is the only oil in the cosmetic, which can be disappointing. However product is full of fragrances (Limonene, Hexyl Cinnamal, Linalool, Benzyl Salicylate, Citronellol, Alpha-Isomethyl Ionone, Hydroxycitronellal, Benzyl Benzoate) and colourants (CI 19140, CI 17200). About eight fragrances combined in right proportions does the trick. Matrix Sharp Cut Oil smells sweet and very intense. There can be sensed jasmine notes and the cosmetic brings to mind high quality hair salon. What is more, it stays on hair long after its use. 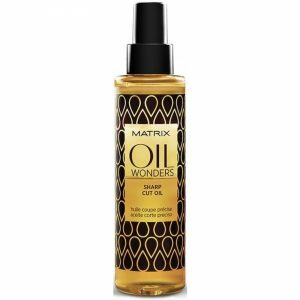 Hair Cut Oil in Matrix Oil Wonders Line is a bi-phase formula. Upper layer is more liquid and see-through, while the lower layer has oily consistency. This product in Oil Wonders Line is lightweight. However, content of few unfavourable ingredients can cause the cosmetic to do more harm than good. Sharp Cut Oil was placed in plastic bottle with 125 ml/4.2 oz volume and curious design. Spray form makes application easier and increases the product efficiency. There is no need for large amounts of oil to style hair. Matrix Sharp Cut Oil is recommended for use prior to hair cut on damp hair. Shake it, spray on towel dry strands and proceed with a hair cut as usual.